This review is of the cut shown at the BFI London Film Festival in October 2018 – the UK release date is currently listed for January 11th 2019. The second and final part of my John C. Reilly double-bill started off strong with The Sisters Brothers, and it ended with a real treat of a film, especially for anyone and everyone who knows and loves the work of the legendary comedy duo Stan Laurel & Oliver Hardy. The pair became Hollywood icons during the first half of the 20th century, known for their hilarious slapstick, impeccable timing and larger-than-life on-screen personalities, instantly recognisable by their distinctive features such as their bowler hats and Hardy’s tiny moustache and larger build next to Laurel’s pencil-thin exterior. Their films enchanted audiences all over the world, and still do to this day, but director Jon S. Baird’s film Stan & Oliie examines a rarely-seen era of their titan status that not only pays tribute to the duo’s timeless appeal, but also shows the more emotional and sometimes heartbreaking side of a friendship seen by millions everywhere. The important thing is, whether or not you’re familiar with the films of Laurel and Hardy, this is a wonderful and sweet film that hits all the right spots. Taking place during the early 1950s, well after their period on top of the film world, Stan Laurel (Steve Coogan) and Oliver Hardy (Reilly) embark on a UK tour showcasing their greatest hits to a paying audience, as organised by theatrical impresario Bernard Delfont (Rufus Jones). They are doing the gigs so they can secure financing for a new Robin Hood-themed picture, but attendance is surprisingly low at first, and their accommodation is far less than glamorous. Attendance does start to rise once they begin doing publicity for the tour, and eventually they are joined by their wives – Lucille Hardy (Shirley Henderson) and the no-nonsense Russian Ida Laurel (Nina Arianda) – but soon some old and unpleasant memories, not to mention Hardy’s flailing health as well as uncertainty surrounding the film they are doing this whole tour for, begin to cause a rift between the duo and threaten to derail their final shot at glory before the inevitable happens. It starts off impressively, with a six-minute tracking shot as Laurel and Hardy – on a Hollywood soundstage in 1937, at the height of their fame – wander through the lot to their set, having a conversation about new comedic ideas, while also running into their producer Hal Roach (Danny Huston) with whom Laurel is having contractual difficulties with; once cameras start rolling, however, the Laurel and Hardy we all know and love immediately appear right in front of us like a magic trick, as they begin filming their famous dance scene from Way Out West. The tone is thus set for the rest of the movie, which sees both of them revelling in recreating their comedy even when not on stage (when they check into a small Newcastle inn, they do so in classic Laurel and Hardy fashion), and you can tell that both Baird and writer Jeff Pope did their homework on several aspects of their subjects’ lives, including their effortless showmanship which they never wanted to switch off no matter what stood in their way. It’s a recreation filled with love and care, with Baird – taking on far different material than his last feature, the excellent Irvine Welsh adaptation Filth – taking a meaningful and respectful approach to this friendship without overstepping the line, showing that even in their hardest moments together they truly did care for one another, to a point to where Laurel does something shocking but noble later on when faced with going on-stage without his trusted partner. It should really go without saying, but I’ll say it anyway; Steve Coogan and John C. Reilly are absolutely perfect casting for Stan Laurel and Oliver Hardy respectively. Beyond the fact that they look eerily similar to their real-life counterparts, with Reilly under some rather heavy – figuratively and literally – prosthetics to recapture Hardy’s larger body at that later stage in his life, both are seriously likeable in their parts, capturing the duo’s spirit and energy almost down to a tee, whilst also opening their characters up to emotions nobody would have imagined a pair like this exhibiting. Coogan, already proven to be just as strong in a more dramatic role as he is in comedy (including in Philomena, which he co-wrote with Pope), is the dry and sardonic vaudeville personality next to Reilly’s warmer and slightly more abrasive persona, but he shows strong moments of human weakness and heartbreak, as he still carries a grudge against Hardy for bailing on a proposed new contract with 20th Century Fox, and he’s utterly wonderful in the part because of it; so is Reilly, who has some very moving moments nearer the end as it becomes apparent his health is deteriorating faster than he’d like it to, yet he still wants to fill people with happiness like the professional that he is. Deserving special mention, too, are Shirley Henderson and Nina Arianda who make a fun comedy duo of their own, especially Arianda who gets some very big laughs with her character’s very direct and unfiltered opinions. Anyone who waxes nostalgic for old-fashioned Hollywood will find plenty to like about this film, from its recreations of Laurel and Hardy’s timeless comedy to how it portrays a career like theirs at a later stage in life, but the beating heart of Stan & Ollie is, well, Stan and Ollie; their bond is shown in the sweetest and most uplifting light, culminating in a final scene that will make any fan of the duo weep with joy for how much of a fine (non)mess they’ve gotten themselves into. 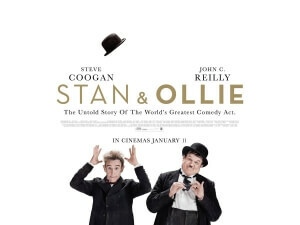 Stan & Ollie is a moving and sweet tribute to one of Hollywood’s most iconic comedic double acts, with Steve Coogan and John C. Reilly perfectly cast as the duo who are served well by a warm and inviting script and direction.